Herkey the Muggin puppy at 5 months old with a slipper—"He’s right around 8 pounds and stands about 7- 8 inches off the ground. I named him Herkey because I’m a huge Iowa Hawkeye fan, and Herkey the Hawk is a mascot of the Hawkeyes." The Muggin is not a purebred dog. 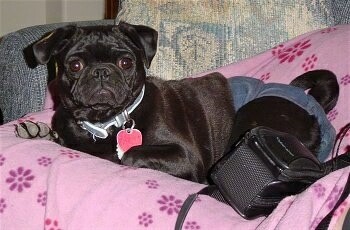 It is a cross between the Miniature Pinscher and the Pug. The best way to determine the temperament of a mixed breed is to look up all breeds in the cross and know you can get any combination of any of the characteristics found in either breed. This hybrid cross is recognized by the American Canine Hybrid Club. Not all of these designer hybrid dogs being bred are 50% purebred to 50% purebred. It is very common for breeders to breed multi-generation crosses. 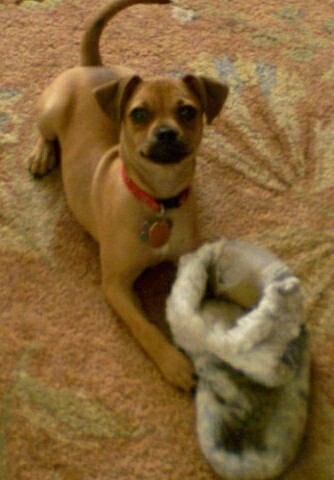 Note: Some call the Miniature Pinscher and the Pug cross a Carlin Pinscher, as this is what the original Carlin Pinschers were, Pug / Min Pin crosses. However, DBI has learned other breeds, thought to contribute to Carlin Pinscher type, have been, and are being introduced to the Carlin Pinscher gene pool in an attempt to create a new breed. Therefore, we have separated the Carlin Pinscher from the Muggin. The name "Muggin" is what the American Canine Hybrid Club calls the Pug / Min Pin cross. If you would like to adopt one of these dogs and have a preference in which type you would like, before adopting, ask the breeder which type dog they are breeding, the Muggin or the Carlin Pinscher. "This is my dog Dozer at 2 years old. 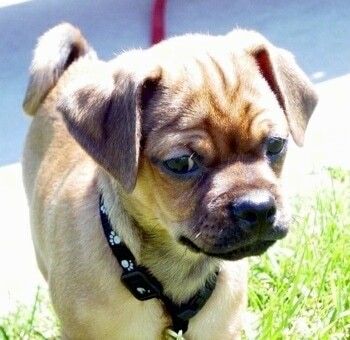 I have heard his hybrid referred to as a Muggin, a Pug / Min Pin, a Carlin Pinscher and a Pugscher. Dozer is the happiest dog I have ever seen. He is very excitable and loves to give kisses. When people come over, they will never get bitten, but they may get licked to death. He is perfect with my 2 young boys and their friends. He is very attached to me and follows me everywhere I go. I can't leave the room without him being my shadow. He also likes to burrow under blankets any time he can. He tends to bark a bit too much, but makes up for it by being so incredibly loving to all of us. He has a high energy level, so he loves to go on daily walks and we also need to control how much he eats, or he gets a little chubby." "His name is Harley. 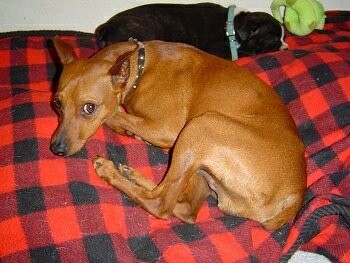 He is a Carlin Pinscher AKA Muggin (Min Pin / Pug mix)." 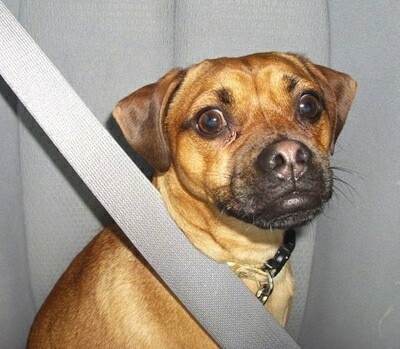 He is wearing his seatbelt like a good boy. Lilly Bug the Muggin (Miniature Pinscher / Pug mix) at 2 years old—her owner says, "I wouldn't trade her for a million dollars, although I have had a woman offer me $500 for her!" 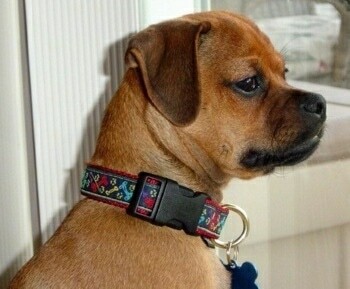 Milo the Muggin (Min Pin / Pug mix) at 3 months old—"Milo seems to have more Miniature Pinscher in him than Pug. He is fiercely loyal and is surprisingly obedient for only having him three weeks with no previous training. His coat is coarse and very short, to the point of being nearly bald on his belly." 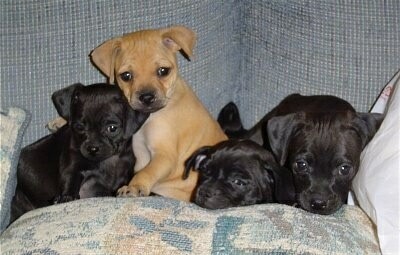 These dogs were the first litter (quite by accident) born to our black female Pug and our red Miniature Pinscher. 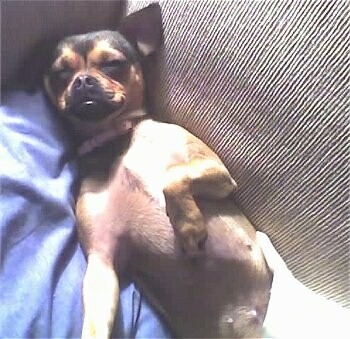 In fact, she was impregnated right around the time the Pinscher got neutered. We found that, overall, the dogs maintained more traits from the Pug than from the Miniature Pinscher. However, they were not as outgoing as our Pugs are because they did maintain a little bit of the skittishness of the Min Pin. One trait that all four dogs kept, however, was the curly tail. It was not as curly as the Pug’s or as tightly wound, but they all had the tail with curl to it.